We are located at 28th Street and Snyder Avenue in Philadelphia, Pennsylvania. We are approximately 3 miles from City Hall. Go South on Broad Street to Snyder Avenue. Turn Right on Snyder Avenue and proceed down to 28th Street and Snyder Avenue. Take I-76 East towards Central Philadelphia. Take Exit 347B (Oregon Avenue) toward Passyunk Avenue. Keep Right at the fork in the ramp. Turn Sharp Left on West Pasyunk Avenue. Turn Left on South 25th Street. Turn Left onto Snyder Avenue. Cross over Walt Whitman Bridge into Philadelphia. Take I-76 West to Exit 346C (Vare Avenue) towards Mifflin Street. Turn Right on New Hope Street. Slight Right on Mifflin Street. Turn Right on South 29th Street. Turn Left on Snyder Avenue. Go up 1 Block to 28th Street. Take Exit towards I 676 West (US-30 West). Keep Left at fork. Follow signs for I 676 West (US-30 West) and merge onto I 676 West (US-30 West). Merge onto North 15th Street. Turn Left at South Penn Square. Turn Right onto South Broad Street (Avenue of the Arts) continue to follow Broad Street to Snyder Avenue. Turn Right on Snyder Avenue and proceed down to 28th Street and Snyder Avenue. Cross over Commodore Barry Bridge. Merge onto I-95 North towards Philadelphia. Take Exit 13 Penrose Avenue (PA-291 East) toward I-76 West. Turn Left on South 26th Street (South 26th Street becomes I-76 West). Take Exit 346C (Vare Avenue) towards Mifflin Street. Turn Right on New Hope Street. Slight Right on Mifflin Street. Turn Right on South 29th Street. Turn Left on Snyder Avenue. Go up 1 Block to 28th Street. Take I-95 North towards I-295 (Wilmington/I-495/Philadelphia). Take Exit 5D towards Port of Wilmington/Philadelphia. Merge onto I-95 North (Crossing into Pennsylvania). Take Exit 13 Penrose Avenue (PA-291 East) toward I-76 West. Turn Left on South 26th Street (South 26th Street becomes I-76 West). Take Exit 346C (Vare Avenue) towards Mifflin Street. Turn Right on New Hope Street. Slight Right on Mifflin Street. Turn Right on South 29th Street. Turn Left on Snyder Avenue. Go up 1 Block to 28th Street. 5:00 PM Vespers and Confessions. 9:30 AM Hours; 10:00 AM Divine Liturgy followed (usually) by fellowship hour. Please visit the Monthly Calendar on the parish website or call for other Lenten, Holy Week, and Paschal Services. 1. Divine Liturgy is served on Saturdays (except the first Saturday) at 10 AM. 2. On Sunday Evenings, Sunday Mission Vespers are celebrated in the Philadelphia area jointly sponsored by the Philadelphia Deanery of the OCA and the Philadelphia Brotherhood of Orthodox Clergy. Call for schedule. 10 AM or 6 PM Liturgy of the Presanctified Gifts (alternates between morning and evening, call for schedule). “newer immigrants” brought a strong religious affiliation with them. Through 1913, the majority of parishioners were members of the Ruthenian Uniat Church, while few belonged to the Orthodox Church of Philadelphia. It was mutually recognized that discontent and frustration existed within the Churches. Thus, it was on January of 1913, that thirty-nine laymen arranged a meeting with Reverand Father J. Krohmalny. This gathering resulted in the formation of a new parish, The Assumption of the Holy Virgin Russian Orthodox Greek Catholic Church, with Father J. Krohmalny serving as our first pastor. It was decades later that our church, along with many others, came under the jurisdiction of the Orthodox Church of America, autocephalous from the Mother Church of Russia. Early church records, being written in the language of our founders and thus difficult to translate, do not allow for a truly accurate history of the parish. Many parishioners recall stories of their parents mortgaging their homes to help raise the money needed to purchase the parish property and to build the church. It is known, however, the first officers elected to parish council were President William Kavalkovich, Vice President John Lapihuska, Secretary Michael Kavchok, Treasurer John Obrazik, Trustees John Brasko, John Homa and Andrew Harhay, Committee Members John Masiko, John Kavalkovich, John Mohanach, Andrew Brasko, Vasil Burch, Peter Lipchak, and Sexton George Pavlik. It was in 1963, the year of the Assumption’s Golden Jubilee, that a new Iconostasis was donated by the parish’s Ladies Auxiliary in commemoration of this milestone. Through dedicated hours of sponsoring bake sales, rummage sales, Christmas bazaars, panics, and other fund raising activities, the women succeeded in raising the $11,500; the total cost of a new Iconostasis, which still adorns our church today. Soon after the Iconostasis was installed, our parish was very fortunate in commissioning the world renowned iconographer, Mr. Matthias Von Reutlinger. Durning the next several years, Mr. Von Reutlinger adorned our church with seventy original icons. As an added not of interest, each one of these icons was donated by either a family or a member or a member of the Assumption of the Holy Virgin Russian Orthodox Church, rather that by an organization within the parish or through contributions from businesses associated with the church. Upon his death in 1985, our parish was privileged to receive one last Von Reutlinger icon. This gift from beyond the grave, is a large unfinished icon of the Temptations of Christ. According to the wishes of Mr. Von Reutlinger, it shall remain unfinished, and is displayed in the Pastor’s office. Even in its primitive sketchy state, the icon revels in beauty and strength, promoting spiritual contemplation and thought. During the period of time between the installation of the existing Iconostasis thru the completion of the seventy icons, nature slowly weathered the old copper cupolas atop our place of worship. A final windstorm caused irreparable damage. 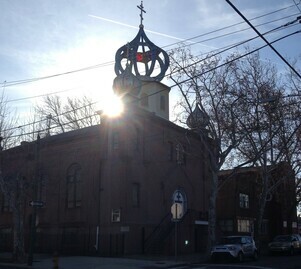 In 1973, the present “rib-type” cupola was erected upon the church rooftop. It’s distinctive style, in addition to the sun casting a gleaming shine upon the brilliant gold and blue, attracts the eye of those traveling along the nearby expressway. Very often visitors are drawn to our parish, if only to admire the unique structure. As the years slipped by, many of the founders and older parishioners of the Church fell to eternal rest. The younger generation was given the challenge of keeping unified through changing times. Various organizations within the Assumption of the Holy Virgin Russian Orthodox Church began to diminish in number. In some instances, such as with the “R” Club and the Ladies Auxiliary, the groups went inactive. However to drive to survive and to preserve what our parents and grandparents struggled so hard to build was never lost. In 1981, a new Ladies Auxiliary, St. Sophia’s Sisterhood, was established. Although small in number, through hard work and many hours, they have shown devotion in their efforts to help with the beautifying and restoration of the Assumption of the Holy Virgin Russian Orthodox Church. They sisterhood is credited for several major projects, including the repainting of the distinctive cupolas and a new parish roof. Additionally, the have donated banners and other church articles. Within many urban parishes children grew up and relocated outside of South Philadelphia along the lines of the new super-highways. Parishioners now live in numerous counties throughout Pennsylvania and New Jersey. Also, the membership of the Assumption of the Holy Virgin Russian Orthodox Church has become more diversified, coming from a variety of ethnic backgrounds. We ask God to give us strength and wisdom to continue to build upon the strong foundation they laid. We ask God to bless our church with a long and healthy future of praising His Holy Name, working for continued growth of His Kingdom, and doing His will in all good things.